1. The moment you start thinking someone needs to go, in general, you will be right. You won't regret your decision. It's your office. It should be as you want it to be. 2. You and your staff should come up with a united and diplomatic way of informing patients who ask what happened. Do not say anything negative. Keep it simple such as, "The doctor just felt that Mary's talents and skills were not a good fit so it was best that she explore other opportunities." Short and sweet. I think you'll find that any fall out is minor and short lived. The idea that you will lose a lot of patients due to the departure of an employee has pretty much been universally debunked. 3. 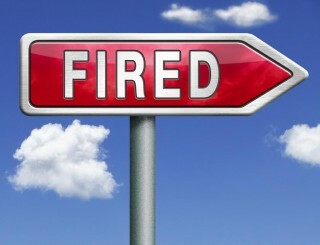 Every state has different rules on what constitutes a legal firing. Check with a local HR person, your lawyer or your state's labor department to ensure your termination procedures are compliant. With that information you can then create a checklist to make sure you fulfill your legal obligations. 4. Exit interviews are by no means mandatory. There are differences of opinion as to whether they should be done or not. One of the benefits of doing an exit interview is they give you the opportunity to ensure that you have complied with all your state’s legal obligations without delay. That being said, if you have a pretty good idea the situation will be volatile, then do not do one, or if the interview does become volatile, call the police (or security if available) for help. While an exit interview can get volatile, it is pretty rare and it is also just as possible that when you fire an employee without one they will come back and cause trouble anyway. If you decide not to do an exit interview, you still will need to ensure you meet your state's legal obligations. Either way make sure you document everything. 5. In general, an employer is free to discuss with potential employers the reasons why a person left as long as you are truthful; however many employers do not care to share such info to avoid any possibility of being sued for defamation, etc. In my humble opinion, if you want to say anything, keep it very simple such as the date of employment and that the person was let go without getting into details. 6. If you are wanting to dismiss an employee based on an arrest, verify that you can do so with a local HR person, etc. Because you are in the health care industry you will likely be able to dismiss based on the arrest - but again, verify first that you can do so in your state. 7. Change your locks, passwords, etc. Collect up any manuals the dismissed employee may have.